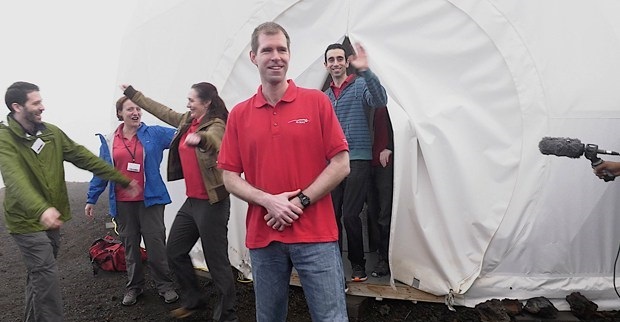 After 365 days, the longest mission in project history, and amidst a throng of media from around the world, six crew members exited from their Mars simulation habitat on slopes of Mauna Loa on the Big Island. The crew lived in isolation in a geodesic dome set in a Mars-like environment at approximately 8,200 feet above sea level as part of the University of Hawaiʻi at Mānoa’s fourth Hawaiʻi Space Eploration Analog and Simulation, or HI-SEAS, project. Like the previous two missions, research over the past year focused on crewmember cohesion and performance. “The UH research going on up here is just super vital when it comes to picking crews, figuring out how people are going to actually work on different kinds of missions, and sort of the human factors element of space travel, colonization, whatever it is you are actually looking at,” said Tristan Bassingthwaighte, a doctor of architecture candidate at UH Mānoa. Bassingthwaighte served as the crew’s architect. “We’re proud to be helping NASA reduce or remove the barriers to long-duration space exploration,” said Binsted. Much of the media interest was generated by the foreign HI-SEAS crew members. “I can give you my personal impression which is that a mission to Mars in the close future is realistic. I think the techonological and psychological obstacles can be overcome,” said Cyprien Verseux, a French HI-SEAS crewmember. “Showing that it works, you can actually get water from the ground that is seemingly dry. It would work on Mars and the implication is that you would be able to get water on Mars from this little greenhouse construct,” said Christiane Heinicke, a German HI-SEAS crewmember. In 2015, NASA awarded HI-SEAS a third grant to keep the research project and its missions funded though 2019. These types of studies are essential for NASA to understand how teams of astronauts will perform on long-duration space exploration missions, such as those required for human travel to Mars. The studies will also allow researchers to recommend strategies for crew composition for such missions, and to determine how best to support such crews while they are working in space. UH’s Binsted is already recruiting for the next two missions scheduled to begin in 2017 and 2018 respectively.